People have been ice skating and playing hockey on Bullough’s Pond since, at least, the early 1900’s. This photo (right), taken in 1921, shows scores of people on the ice. Contrast this image with the one just below it, taken recently. The City of Newton now discourages skating on Bullough’s Pond, although some skaters ignore the posted signs and skate when the ice is thick. The pond is not as deep as it once was, because of silting from storm drains and other sources. Water flows through Bullough’s Pond at a faster rate as the pond silts up and becomes shallower. Swiftly flowing water doesn't freeze well. There hasn't been regular testing of water quality, water depth, or winter ice thickness at Bullough’s Pond. 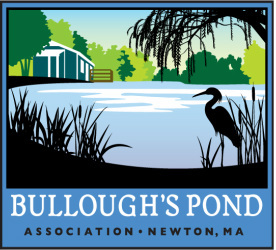 The Bullough’s Pond Association is developing plans for regular testing at the pond. Collection of real data will answer questions about whether skating on a large scale can return to the pond. It can also guide decision-making about the best steps to take to improve the condition of Bullough’s Pond in all seasons. Many in Newton have memories of ice skating on Bullough’s Pond in their youth. There’s a long history of ice skating here. In this photo (left), taken sometime around 1910, boys play hockey. Few homes have as yet been built on the Walnut Street bank. Bullough’s Pond was such a popular skating area that trolley cars carrying passengers between Boston and Newton would display signs to let people know when the ice was good for skating. 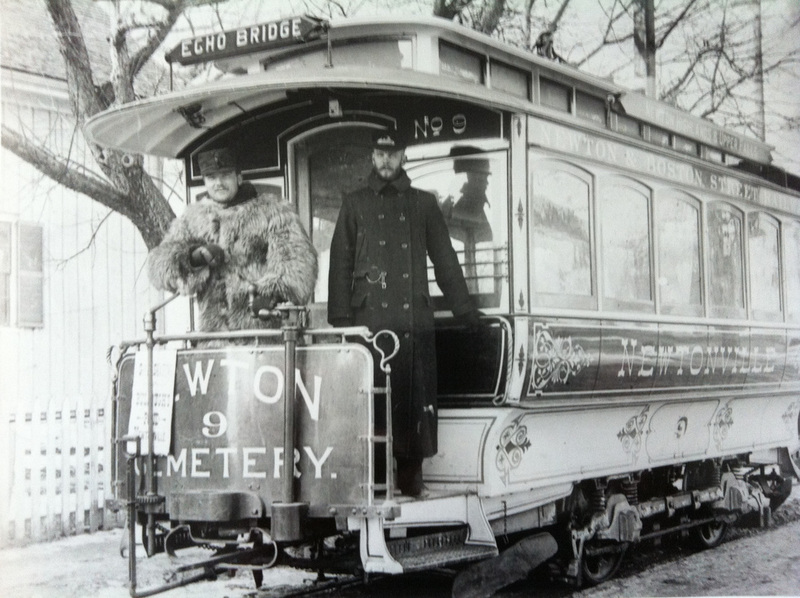 The white sign visible on the front of the trolley in the photo below reads “Good Skating at Bullough’s Pond Newtonville”. Bullough's Pond was maintained in the early 1900s by Newton's Forestry Department, and later by what is now called the Parks & Recreation Department. 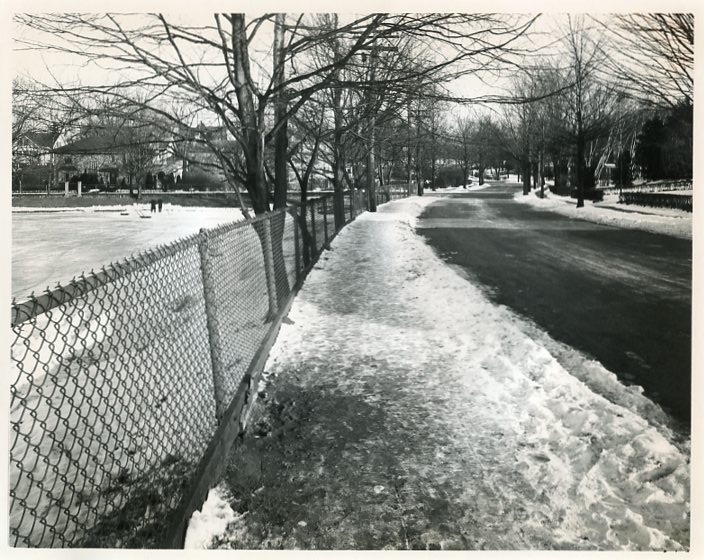 The City of Newton did such a good job of maintaining a safe ice skating surface on Bullough's Pond that it was asked to advise the City of Boston about creating safe skating conditions along the Esplanade. As automobiles became more commonplace, people drove to the pond to skate. “Bullough’s Pond has become a very valuable part of our winter recreation scheme. It is a valuable health center and helps many thousands of our young people, as well as older ones, to spend hours a day under wholesome and safe conditions out of doors”. Skating on the pond, 1930’s. Photo, Newton Parks & Recreation Dept. 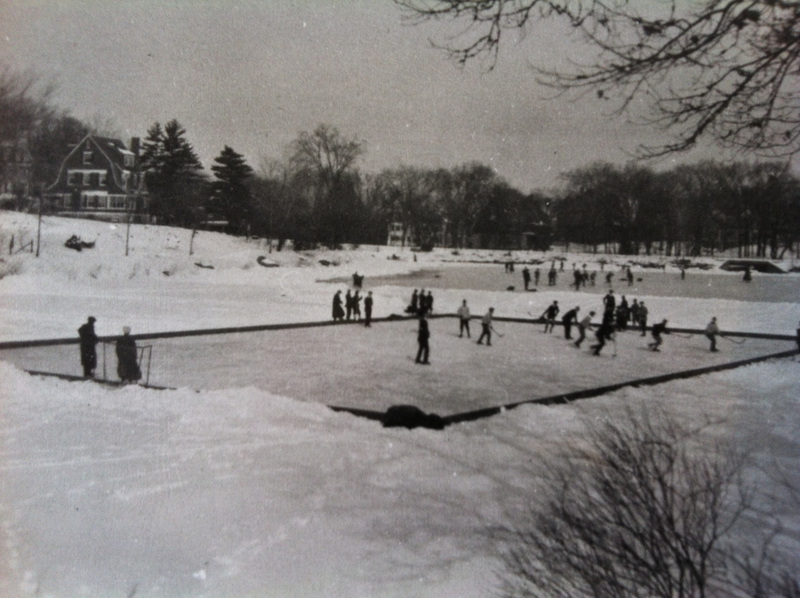 Safe skating conditions at Bullough's Pond continued into the 1930s and on through the decades until the 1970s. 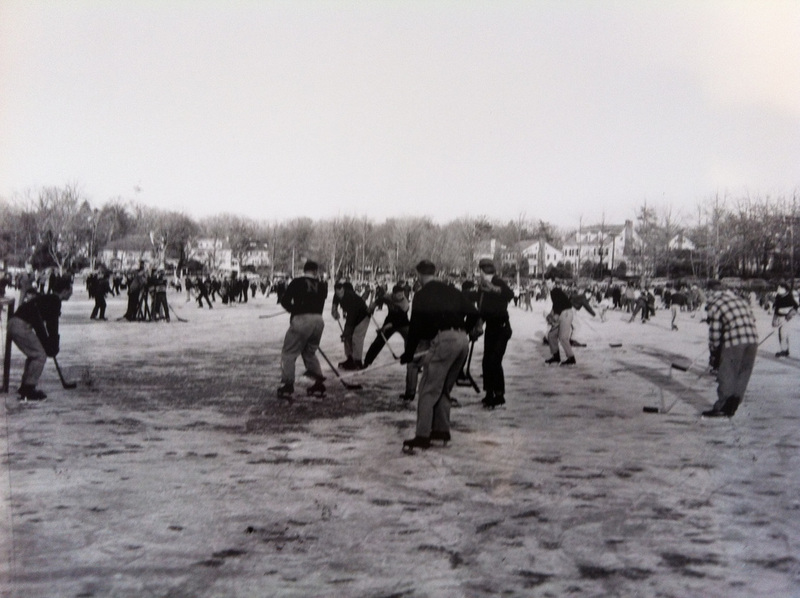 In fact, the condition of Bullough’s Pond and its ice was so reliably maintained by the City in the first half of the last century that the hockey team for Newton High School (now Newton North High School) played their home games at Bullough’s Pond. The photo at right was taken on January 20, 1955.
to BPA historian Peter Konde. A hockey rink was created each winter at the northeast corner of the pond, and the rest of the pond was also cleared of snow for general skating. At first horses were used to clear the snow, but later trucks with snowplows did the job. This photo (right) made news in the Boston Globe at the time. The snowplow truck has broken through the ice. 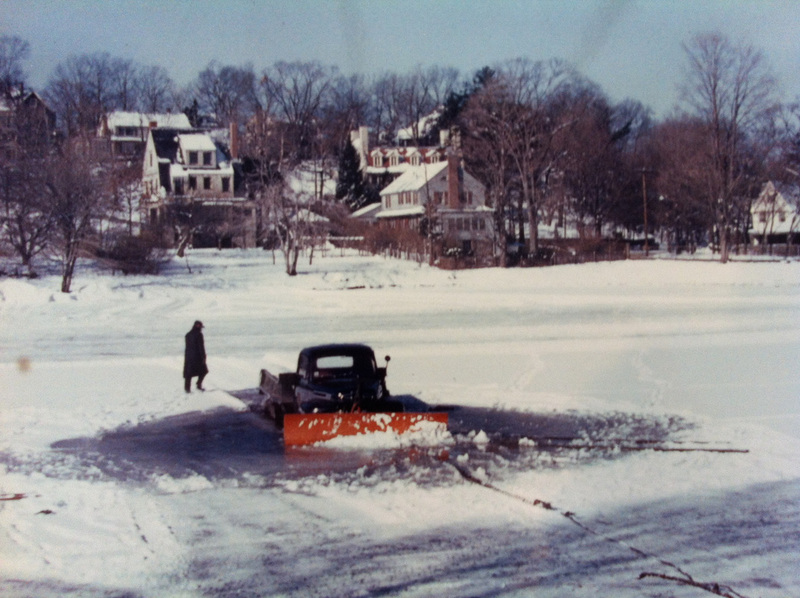 Skating continued at Bullough’s Pond through the 1960’s and 1970’s. In the 1980’s the pond became shallow from silting, and ice that formed was too thin to support safe skating. The Bullough's Pond Association campaigned for almost a decade for funding to dredge and restore the pond's health. After the pond was dredged in 1993, City-approved general skating resumed for a number of years. If you have any memories or photos of your ice skating or other recreational activities at Bullough's Pond in years past, that you'd be willing to share, we'd love to collect them to preserve the history of Bullough's Pond. With your permission, we'll share as many as possible on this website. Please get in touch.